I was in the mood for a green smoothie this morning but wanted something simple. I decided to put a frozen banana, two cups of spinach, and a cup of unsweetened almond milk in my Vitamix, and the result was a creamy, thick green smoothie. 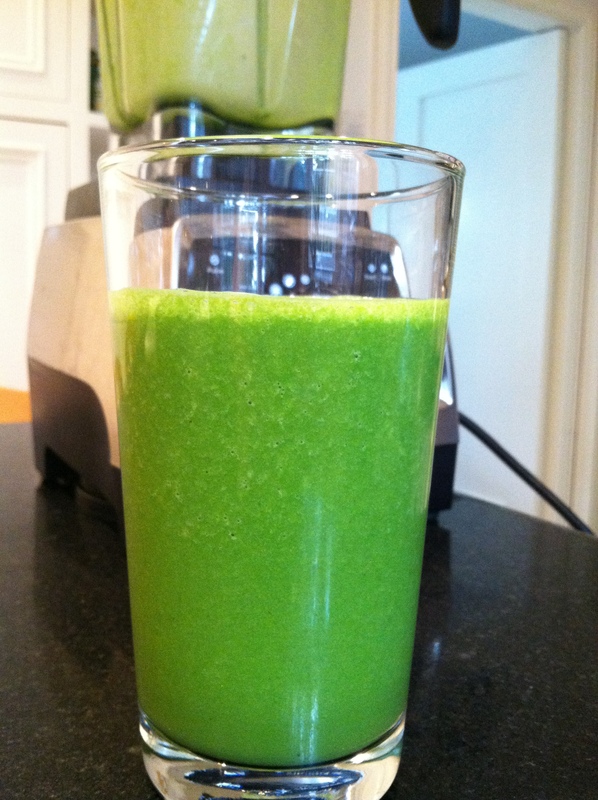 This green smoothie is incredibly simple to make but so delicious. You can enjoy it as is or use this as a base for your green smoothie and then add in whatever else you like such as flaxseeds, berries, or chia seeds. Thoroughly wash your spinach and then add that in your blender or Vitamix. Also add in your one cup of unsweetened almond milk and your frozen banana and blend on high for about two minutes. Note: I personally think the frozen banana makes this smoothie so good! I’ve made it with a regular banana, and it’s good but the smoothie is room temperature. Adding ice helps but it also waters down the smoothie a little. So if you want to have a nice cold, refreshing green smoothie, use a frozen banana. Simply cut a banana into chunks and put it into a ziploc bag in the freezer and then you’ll have your frozen banana for when you decide to make this smoothie. Enjoy your spinach, banana and almond milk smoothie immediately! One serving of this delicious green smoothie will give you 162 calories. This smoothie has 31 grams of your total carbohydrates, 5 grams being dietary fiber. One serving will also give you 992 milligrams of your daily potassium and almost 4 grams of protein. In terms of vitamins, this smoothie provides you with 25% of your daily vitamin D, 40% of your daily vitamin B-6, 46% of your daily vitamin C, 57% of your daily vitamin E, and 124% of your daily vitamin A. 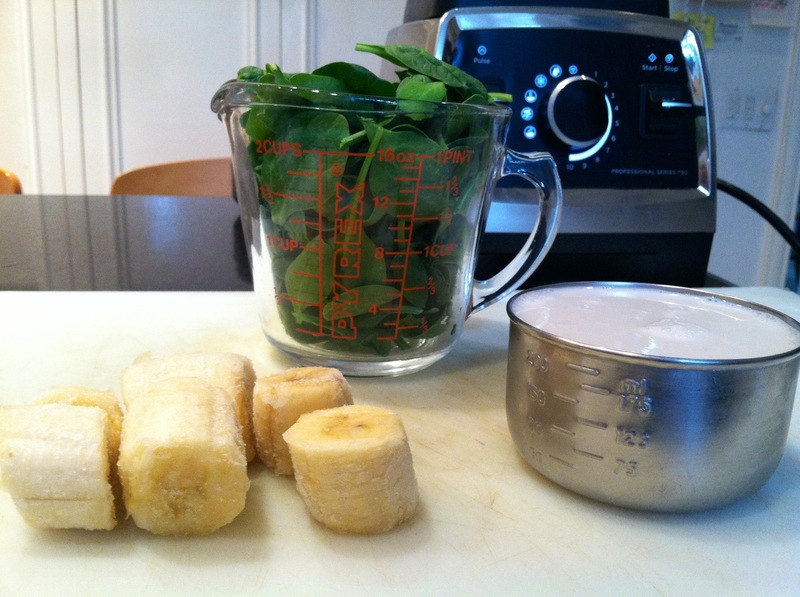 This spinach, banana and almond milk smoothie will also give you lots of minerals. Some of those include: 10% of your daily copper, 13% of your daily riboflavin, 34% of your daily folate, and 51% of your calcium. This is exactly what I had in my blender when I went googling a recipe to make sure I wasn’t making a disgusting combination. Added 2T of almond butter and a scoop of vanilla protein- YUMMY! There is nothing better than a green smoothie to start the day! I agree! I love having a green smoothie in the morning. I like adding in what you added in. I also sometimes add in peanut butter and chocolate protein powder. That is also a delicious combination! This recipe is perfectly delicious. I added a hand-full of ice because my bananas weren’t frozen. My 15 month old was loving every spoonful too. Thanks! Thanks! I’m so glad you both enjoyed it. I sometimes add ice if I don’t have frozen bananas. It’s just as delicious that way too! Sounds delicious! I need to try a smoothie with green tea in it soon. It sounds really light and refreshing, especially for summer! I love your recipe. I added a half cup of cooked oatmeal (chilled overnight in the fridge) when blending everyting. Makes for a more ‘substantial’ smoothie. What a great idea! I bet that tasted great. I’ll have to try making it that way. I’m glad you enjoyed the recipe! I make mine this way, but add a few mint leaves. Delicious!